Tonight as I was dining with my son, he remarked that he took a nap that lasted exactly 90-minutes. I find it sad that not only doesn’t the educational system teach kids how to write checks, write cursive, and format business letters; but I find it tragic that it has never taught us sleep architecture- something that we need to understand to live well. I became interested in this after taking TA-65, an adaptogen that had the curious effect of producing brief awakenings. Upon further study, it seems that nearly all of our internal clocks are timed around 90-minute cycles. If you observe normal sleep with brain waves, breathing, heart rate, pulse, eye movements, and body movements, it is a fact that people do normally awaken every 90 minutes but unless you are cold, it is noisy, or you have to pee, you aren’t even aware of it. I noticed that people taking adaptogens before bed have a stronger sense of brief awakenings and I have used this as a heuristic (active empirical test) to know that the dosage is adequate. 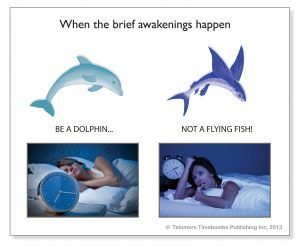 Instead of waking up and doing things like a flying fish, people who are aware of this side effect can ignore it and indeed be asleep within seconds when they realize it is just a normal side effect. I tell them to be like the dolphin instead. Why does this happen? I believe that the reticular activation system, which is like a garden sprinkler on a 90-minute timer, is just more efficient in awakening the patient. One caveat I should share is those with untreated sleep apnea should take care. I had a friend take TA-65 with very severe sleep apnea and instead of the hypoxia waking him, it triggered a slow heart rhythm. 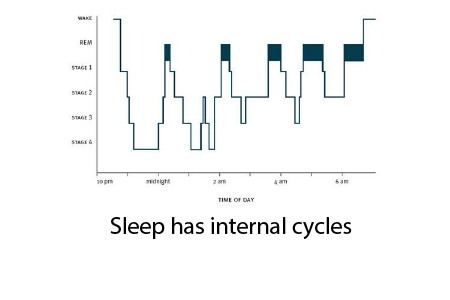 Learn more about sleep architecture from my book, The Telomere Miracle. There are now apps that can infer where you are in your cycles and wake you at an optimal time between them. If you use them, be sure to go into airplane mode and you may want to turn off location services as well (in privacy setting on the iPhone). I haven’t learned how to do this on my new Android phone yet. It makes a big difference if you don’t get rudely awakened during R.E.M. sleep!